I don't think everyone who's a pro or in challenger is smart in a broad way, but almost all have better decisionmaking than the vast majority of players. I don't tune into league players to figure out their thoughts on Proust, but the ability to quickly analyze a situation, decide what to do, and (in the case of pro play) communicate it to your teammates is definitely a kind of intelligence that I don't take lightly. Much of that comes from time in, but when we're talking about the very, very tail end of the skill curve, we're not talking about just hard work. It's also important to remember that most times you only get to see one game from a player. If somebody is the same elo as you, they are probably about as good as you unless you're currently climbing fast. That person who is splitpushing and getting assassinated constantly as adc probably doesn't do that every game; they're probably tilted or just out of it. what if i'm bronze v, llamarble. What then? so in pro play, vlad is decidedly a thing. In my own games I haven't seen any of the go off and put the game on his back. I've played him myself short after the mage update, but I'm hardly a specialist on such a champ. The fact that every 3rd Q deals double damage (with not bad scaling) and heals for a % of his missing health. He just ends up being a tanky sustained mage that actually deals a decent amount of damage while being healthy and being impossible to escape. In high level play, having strong pushing power is very very important. It enables wave control when you can choose to push or not (champions that can harass without pushing are best for this). Vlad shoves like a god but doesn't have to in order to trade in lane. Additionally, his aoe is great, and the fact that his q gives him movespeed / his e slows (in an aoe!) enables for better kiting when being chased or chasing than he had before the rework. His damage scaling was massively improved and his survivability as well (which for a damage over time mage is very relevant). He's a hard to kill split pusher that destroys mages in lane. It doesn't help that league has slowly shifted into a sustain meta, and Vlad sustains very well. I guess it'a angry at me that I didn't CS and did no damage, but AP support Lulu doesn't do those things. I want to say that the featured game mode algorithm isn't tuned for supports. The algorithm isn't tuned for supports, period. I'm getting really good at lux, so close to lvl 30! 83 cs is also super low. It doesn't compare to your *team* it compares to *other cho'gath players* and my average cho'gath game (even bad ones) are 100-200+ cs. I lost a couple of bot games last month too. In one I had four bots in my team and I was playing Janna. 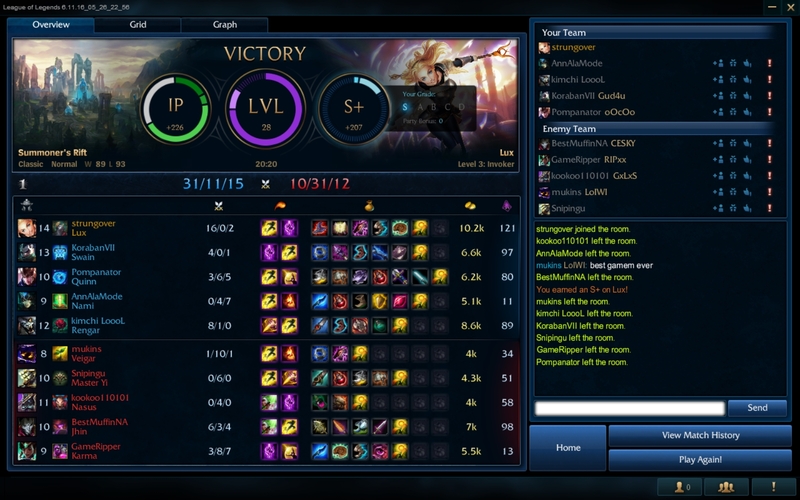 In the other I had two bots, an afk troll riven and a newbie. Have avoided bot games since then. I remember like a year ago when the bot problem was at it's peak you could get into games easily with 4+ bots. At the moment from what i can tell, a majority of the bots use the same naming conventions, and can be easily spotted, not that riot cares. I once played a TT game with 5 bots (not like.... riot bots but leveling up bots). It was awful.